Oh. My. Goodness. I can’t believe I am finally able to write this post. 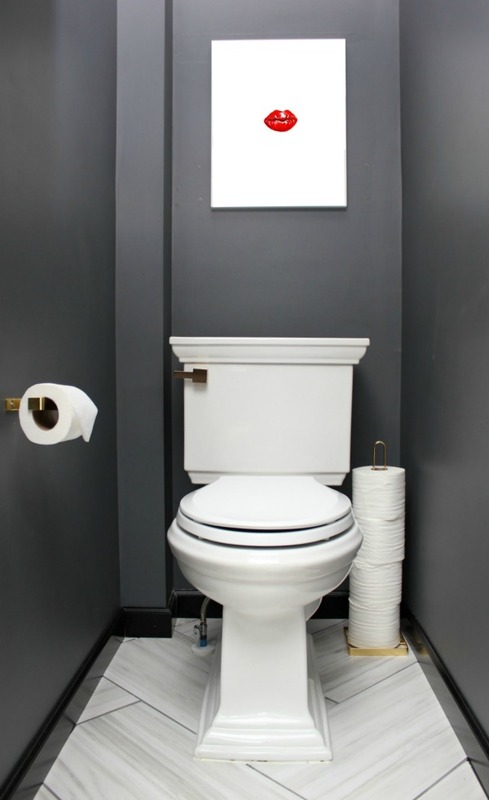 As if the bathroom project itself wasn’t hard enough to pin down a design for, this space just so happened to also be the victim of our contractor nightmare. And then when we finally did find a good contractor to complete the space, we came up six pieces of trim tile short. And that tile was out of stock for at least two months. And then finally the company made some more tile and I had to figure out how to get those extra six pieces of tile and not have to pay an $80 shipping fee for a $25 dollar order. Lord bless my mother-in-law who went on an adventure to locate the tile warehouse to pick up the tile so we didn’t have to pay that shipping fee. So then I finally go to take photos of the bathroom – only to discover it is the hardest room in the world to take good photographs of. The window in there is my worst enemy. There was no shower in this bathroom before – only a jetted tub. The toilet was behind that half-wall you see there. Now, we have a shower, tub, and water closet. There was some major re-configuring that had to be done though to make it happen. The old doorway was sealed up (which was the angle from where those before pictures were taken), and we put a freestanding bathtub against that wall. A new door was put just to the right of the bathtub. I was a nervous wreck picking out a bathtub. There weren’t any affordable options around where I live that I could actually go and look at, so I had to go with buying it online. 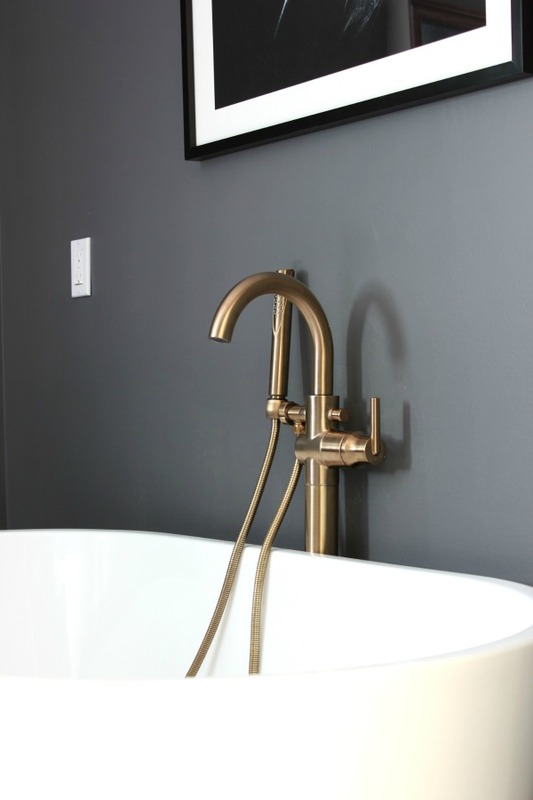 I ended up going with the Eden Freestanding Tub from Signature Hardware. They seemed to have the best prices paired with great reviews and that made me feel better about the purchase. Luckily, this tub was the way to go and I have zero complaints about it! 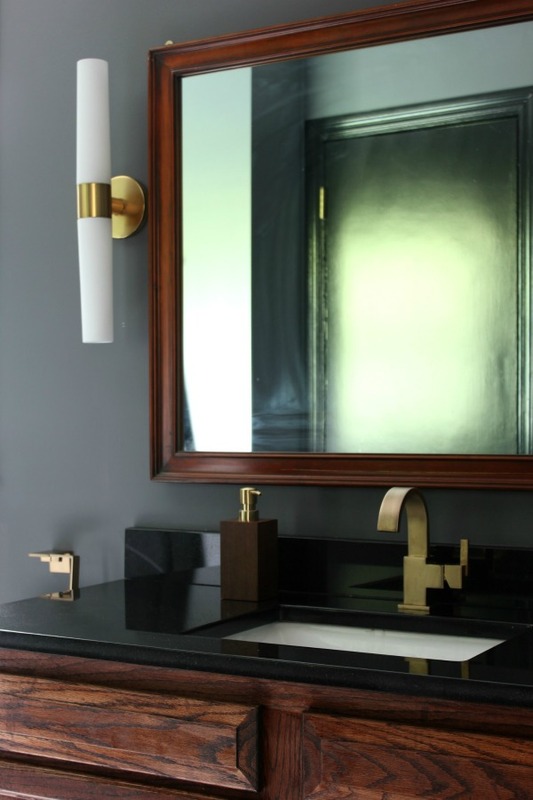 We did brass fixtures and faucets throughout the bathroom, light gray tile in a herringbone pattern for the floors, and dark gray walls (Dark Ash by Behr) paired with black trim (Limousine Leather by Behr). I had wanted to put a tile surround around the bathtub, but the budget just didn’t allow for it. I may go back and have it done eventually. Once everything was installed and the walls were painted, that wall above the bathtub was very still very bare though. 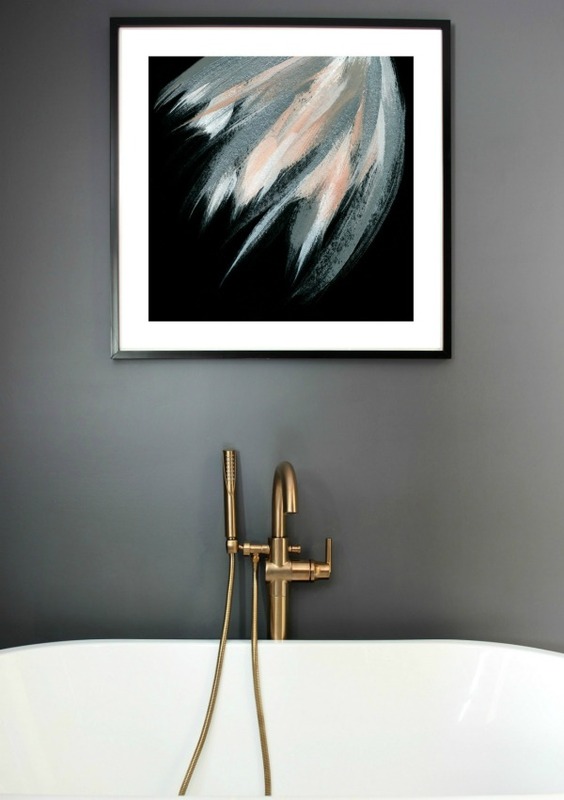 I solved that problem by hanging a piece of art above the bathtub, Wild and Free by Simona Cavallaro from Minted. Not only did it help with the bare wall, but it also brought in a touch of color with the peach in the art and added a feminine touch to an otherwise very masculine bathroom. On the opposite end of the bathroom, where the jetted tub used to be, is the shower. The new vanity is in the general location of where the old vanity used to be, it’s just not near as long. Once more, I was super picky about finding a vanity. I really wanted to have a stained one because I love a good black and stained combo, but couldn’t find one already stained I liked that didn’t also cost a fortune. I ended up going to a local “seconds” store and buying an unfinished one and staining it myself. I still have to find some hardware for the doors. Right now, I have a mirror which actually goes with the Circus’ dresser above the vanity, but I’m not 100% sold on it. The stains on the vanity and mirror are two different ones. I don’t know if a solid black framed mirror wouldn’t look better? Thoughts? 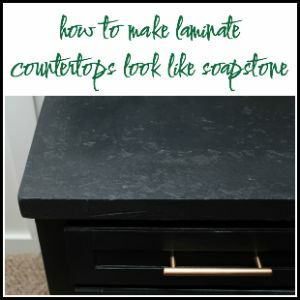 The countertop is black granite and the faucet is also champagne bronze like the rest of the fixtures. The sconces are one of my favorite things in the space. They can go horizontally above a mirror or vertically, so I opted to turn them vertically and place one on each side of the mirror. Across from the vanity is the water closet. We were able to take out an old linen closet that was in the bedroom, but on the other side of the bathroom wall and then carve out a bit more space from the bathroom to make the water closet happen. We got a new toilet and even the champagne bronze lever that matches the rest of the fixtures for it. Eventually, we plan to add some shelves above the toilet, but for now the Lips art works well. The brass toilet paper tower storage and the brass toilet paper holder are part of CB2’s brushed brass bathroom collection and they by far have the best prices on that kind of stuff that I’ve found. So what do you think? Did we do alright on this master bathroom remodel? You’re probably going to want to see this too…. Disclosure: Minted provided me with the art above the bathtub and Delta provided me with the faucets and towel holders. However, all opinions are 100% mine. This turned out beautifully, I absolutely LOVE the shower! 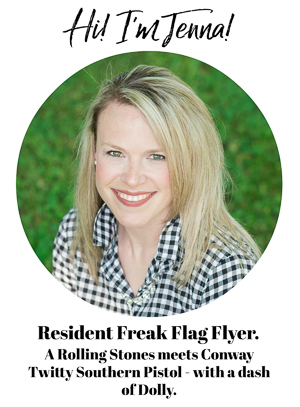 Thank you so much, Stacey! I’m glad to hear that! It’s even prettier in real life! Great job! With regards to the mirror over the sink, a black frame probably would look best. As always, you make overs are fantastic! Thanks, Beth! That’s what I’m thinking about the mirror as well – thanks for your input! 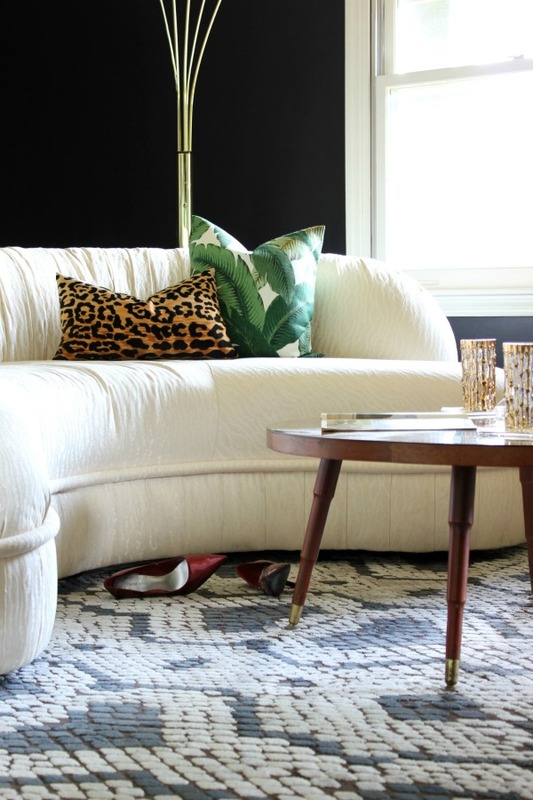 Wow What a transformation – beautiful and bold! My vote would be for a black mirror above the vanity. I think it would tie in with the trim and pop on those beautiful gray walls. Thank you, Anne! I think I’m going to have to get on the hunt for a black mirror! OMG, The bathroom is fantastic!!!!!! The stain on the mirror frame looks (from your photo) like it does match perfectly. I think the stained look is very nice, but I also think black would be very classy. Everything you have done is Amazing. Love the artwork, love the hardware, love the vanity, love the gold stool in the shower, love the tub and the toilet…LOVE, LOVE it ALL!!!!!!!!!!!! Thank you so much, Bonnie! Thanks for your input on the mirror as well! I think I might be leaning more toward the black frame right now…. I’m so glad you love it! Love it all, you are such an inspiration!!!! Thank you, Sara! That’s so sweet of you to say! OMG! Gorgeous!!! I love the tub faucet. The difference in the stain on the vanity and mirror doesn’t bother me. The vanity has lots of different tones; the mirror picks up a couple of them. Great job! Thanks, Cindy! 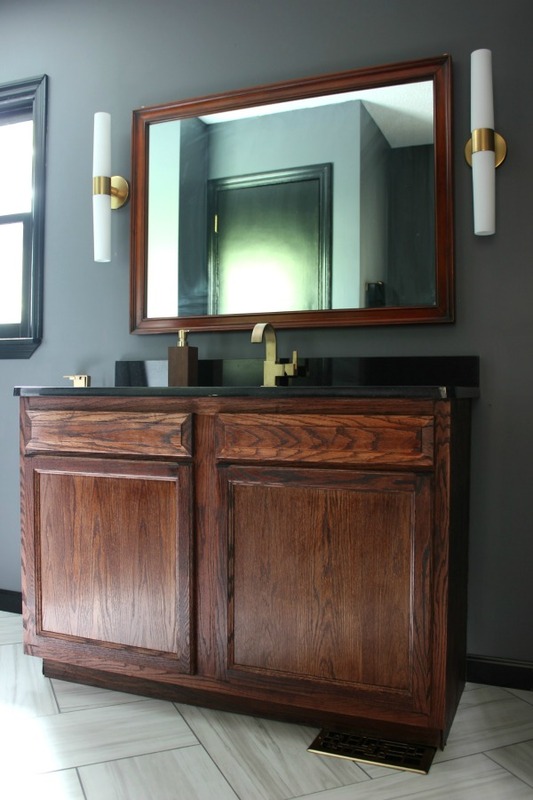 You are right, the vanity has lots of different wood tones – didn’t think about that! Oh wow! What a beautiful bathroom! I love that bathtub. Great job on the remodel! Absolutely stunning! Everything you have chosen is perfect! Enjoy! Oh wow, the bathroom turned out so beautifully. I love it. What a before and after. Absolutely stunning! I’m throwing my vote in for a black frame on mirror. You are the paint Queen, just paint the present one black. Or might the Circus want it back? Lol. Again, awesome job! Absolutely gorgeous! Very posh & sophisticated. I love your master bath, that tub is so gorgeous and your shower is to die for, I love walk in showers without doors or curtains, that black tile is so beautiful and looks so rich, and I love the artwork. the champaign brass is beautiful, I love it, again just so rich and classy. I really think a beautiful black framed mirror would set the vanity area off perfectly. in my last house I wanted a black framed mirror and I could not find what I wanted in black, but I found one that was brass and marked 75% off so I grabbed that baby and it was perfect so I grabbed some black paint and painted, then while the paint was still wet I started rubbing enough so that in the high areas the brass showed through and around the edge of the frame. It turned out beautiful and added so much to that bathroom. Thanks, Patty! Your mirror sounds gorgeous!!!! You’ve got me wanting to go that route now! I’m going to have to keep my eyes peeled for a mirror! Jenna, I found that mirror at World Bazaar back in the 70’s when they carried a lot of cheap brass that is why I painted it. I don’t even know if they are still in business any longer. Of course you did!! haha! I’m jealous! Never heard of World Bazaar. World Baazar is or was a chain of stores with a little bit of everything. They had a lot of merchandise that had a Moroccan and Bohemian theme, they were reasonably priced, and you could find really unique stuff in there. Cool, Patty. Sounds kind of like World Market! Jenna, you and Grunt Labor, will NEVER want to leave this room! lol It’s totally AWESOME!!!!!!!!!!! 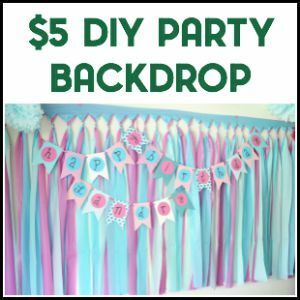 Re the mirror – girl, with your many talents, I would just paint the trim to the mirror black and put the money saved towards something else. It will work. and most of all ENJOY!! Thank you, Julie! That’s what I might end up doing with the mirror! I just worry that what if we need the mirror to match that dresser it technically goes with again one day…. This bathroom looks awesome, you did a great job! I agree, I think it needs a black mirror, enjoy! That is an amazing transformation! 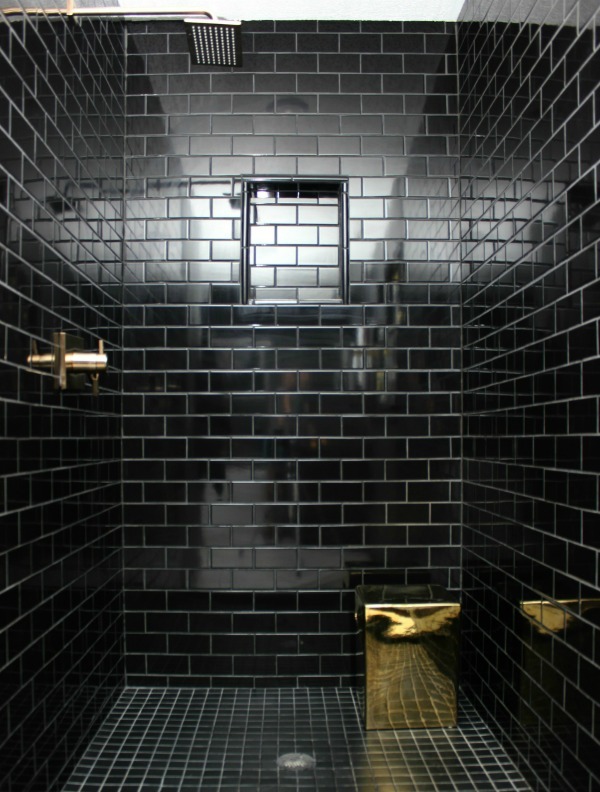 Not everyone has the guts to do an all black tile shower! The toilette looks top o’ the line! 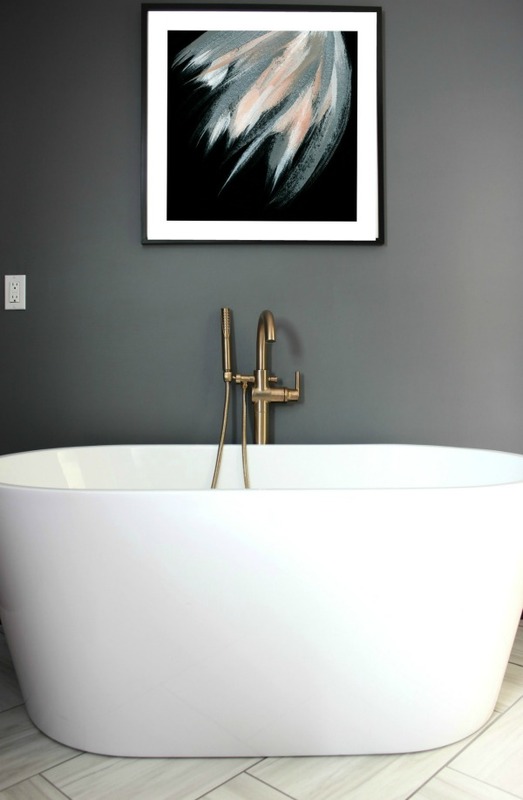 My fave is the artwork over the tub……no, the tub! The tub is my fave! Oh well…I love it all! Fabulous as always ! Thanks for sharing! Thank you so much, Jeannee! Girl, I had to have that black tile!! Love it! The tub is pretty relaxing though too! Oh….MY GOSH! That is gorgeous for sure, especially the shower. How big, or what dimensions, do you need to be certain the water doesn’t come out? I’m wanting to change out my master bath area and do something similar, but I also want to make room for my front loading washer and dryer. Thank you Sharon! So our shower is about 4′ x 4′ square. However, I think you could have a smaller shower and the water wouldn’t come out as long as the shower floor was sloped correctly toward the drain. You might still get a sprinkle here or there, but that’s it. The window casings are actually black like the rest of the trim. I’m not sure why it looks gray in that one photo. Oh yes, Sharon! We love this bathroom!! Love love love it!! 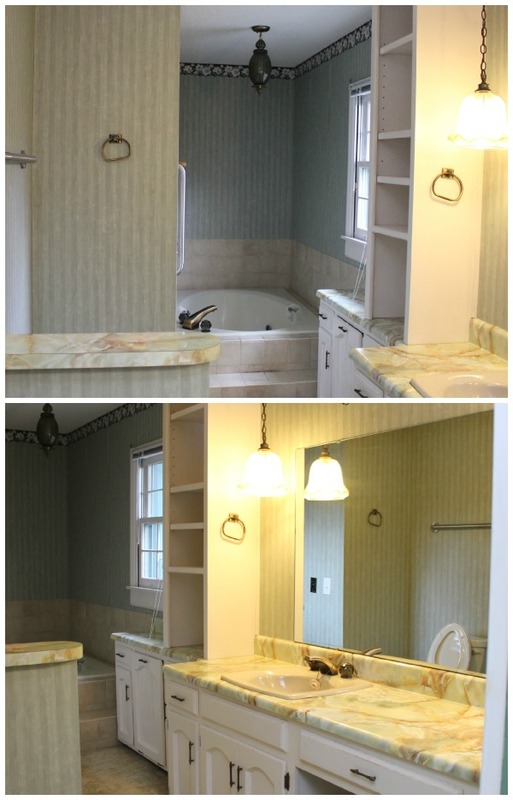 The bathroom is gorgeous, especially the tub and shower! I think a black mirror would be perfect…it would nicely tie in the black trim! 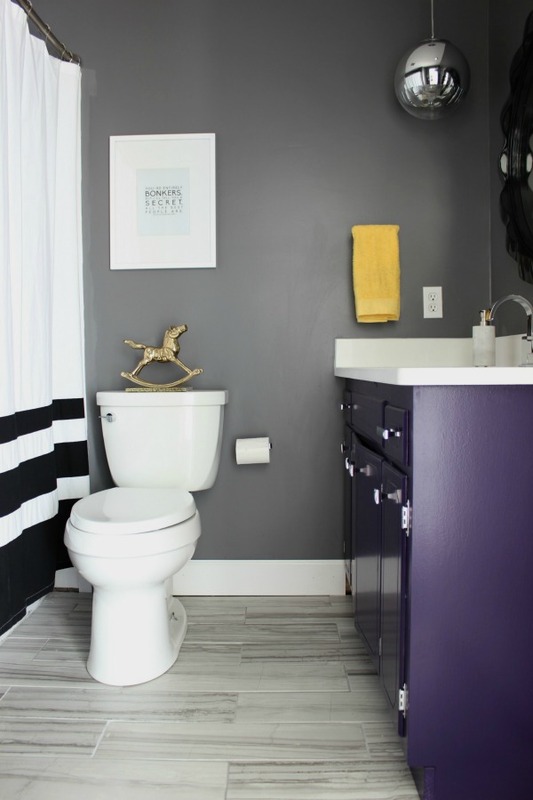 Your bathroom is definitely bold and fearless!!! Kudos!!! Great minds indeed, Anna! I love those sconces!! I do like the idea of the round mirror – the only problem is that there is some not so pretty drywall behind that mirror. There was some damaged that had to be repaired and it doesn’t exactly look great…. Awww, sad! and totally understandable. Did your new contractor do the patching? No, we did. There was some electrical issues that we actually had to change up after he had done the work and required ripping out some drywall. It was something small so we didn’t want to pay to have it done when we could DIY it. I had never considered the round mirror option, otherwise I would have thought twice. I always figured I would have a big mirror to cover it. Looks perfect, even the mirror over the vanity, you rocked it. Thank you so much, Arlie! GORRRRRGEOUS!!!! All of it!!! I agree with the general consensus of a black framed mirror for above the vanity. I think it would look sleek and elegant and also would allow those (KICKASS!!) sconces to really pop off the wall. Also I’m glad someone finally spoke up about not having anywhere to shave your legs in a stand up shower. Literally a deal-breaker for me when I’m looking at houses. No bench (or at least somewhere to put something neat like your stool) no want! Girl, we gots to be able to shave our legs easily. Because let’s be honest, otherwise they ain’t getting shaved! haha! Oh my gosh I have to say I am jealous of your tub. I keep seeing it and it calls my name. I think a black mirror would be awesome at sink. Bold on bathroom. Glad finelly done. Thanks, Stephanie! That bathtub was the one non-negotiable! I have always wanted one and if I was going to completely gut and remodel a bathroom, then I was going to have that tub! I love the tile flooring the herringbone pattern. Would you mind telling me where you got it? Thanks, Sallie! I had really wanted a completely herringbone pattern shower, but it was going to cost double the price because it takes so much longer to do. It was only $200 more for the herringbone pattern on the floor so I opted for that. There’s a link to the tile in the blog post near the top I believe and it’s also here: https://www.happy-floors.com/products/apollo/ It’s the grey one. Everything everyone else said PLUS I love how your stain showed off the wood grain and I love the baseboard. 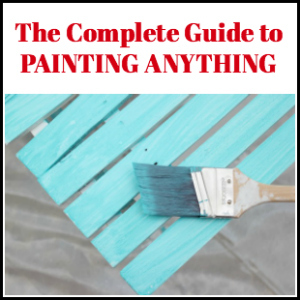 Is it just painted wood? What is the “champagne bronze?” item next to the vanity? Love it and about to pin it! Jenna you guys did a great job! Love the bath, paint colour, artwork, tiles, stool- in fact everything! How annoying that you were 6 tiles short though. You have done such an amazing amount of work in such a short space of time. It is such a transformation! It was so annoying, Shirley, but I’m glad we are done now!! Thank you so much, I’m so glad you like it! Your bathroom turned out stunning! I love that you have a walk in shower with no doors to clean. we live in a place where limescale is evil and sticks to everything so there’s much door scrubbing and still they are caked with the stuff so I would love to just get rid of them. Great inspiration thank you once again Jenna:) And Ps. your freak flag black tile wall!!!! love it.. Thank you so much, Marie! I love no shower door as well! Honestly, I would never get it cleaned like it needed to be – I would always give up on getting it perfect, so it’s great to not have to worry about it! I see that mirror painted a gold matte finish. Or buy one that is gold! That would be pretty too, Marcia! Thanks for the idea! Odd question…. What is the “water room”? Is it where you have your hot water tank? Beautiful remodel! Do you feel all this work paid off or is it still in progress to the “love it” stage? It’s just where the toilet is. 🙂 Yep, I think it has definitely paid off! We love it! Darling girl, you can come and redo my bathroom, or any room for that matter, brown frame and all. haha!! Thanks so much, Carol! This is just sooooo good. Thank you so much for sharing this post. I am doing a small powder room using the Delta Champagne Bronze faucet, towel bar and toilet handle. I have been going crazy looking for a light fixture that comes in a coordinating finish. No lighting showroom ever suggested George Kovacs. That finish looks pretty close. Glad it was helpful, Peggy! Yep, I think that George Kovacs one works really well with the other Champagne Bronze fixtures! Freakin’ awesome elegance says MWB. Ooo, I like that description! Thanks!